Bolivian police have clashed with residents protesting against the construction of an anti-drugs military base in a coca leaves producing region. Local leaders said most people feared that the increased police presence would lead to violence and abuse. Regional police chief Johnny Requena blamed drug gangs for the opposition to the base, in the city of Yapacani. Bolivia is one of the world's main producers of coca leaves, the raw material for cocaine. The violence happened ahead of a ceremony to lay a cornerstone for the base. Police fired tear gas canisters at protesters who hurled stones and set up road blocks in attempts to prevent the ceremony going ahead. The European Union is financing the anti-drugs centre, which is expected to cost $1.3m (£800,000). Local councillor Max Barrientos told AP that Bolivia's anti-drugs police are abusive and rough up people suspected of trafficking. Yapacani borders the Chapare coca-producing region and is known as hub for drug trafficking to Europe and Brazil. The production of a limited amount of coca is allowed in Bolivia. Indigenous communities traditionally chew the plant and use it in teas as a mild stimulant and to alleviate altitude sickness. President Evo Morales is a former president of the coca leaf producers union. 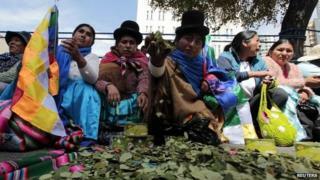 He has led an international campaign to decriminalise the Andean tradition of chewing coca leaves. But the government regularly wipes out illegal crops and has programmes to tackle drug trafficking.